I’ve been working for Trimcraft for two weeks. 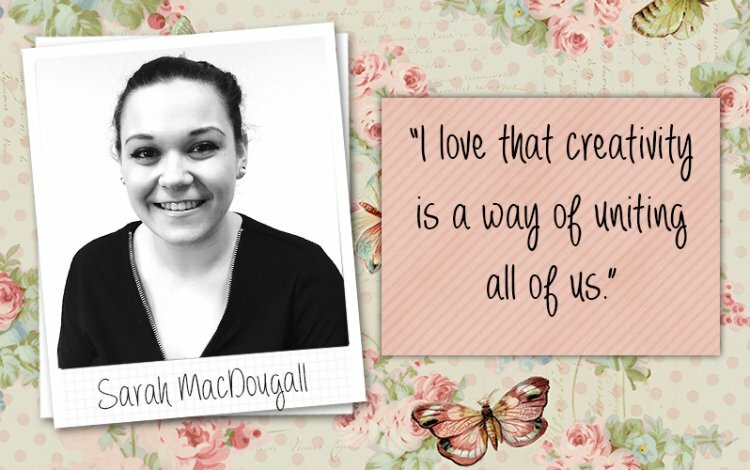 I’m a Marketing Assistant, so my role is to support the Marketing team with Administrative duties. I proof new packaging; write the articles that are posted daily, manage the social media pages and write copy for new products. I also do research on crafting ideas that are on-trend and help the team brainstorm new projects to post in the future. I usually start the day by checking my emails and the Trimcraft page to see all the wonderful makes that have been posted by all of you. I then make sure that the article for the day is proofed and ready to post. After that, it really does differ! It’s usually focused on writing or proofing, which I enjoy. I love seeing the new, fresh designs that are being created by our Design team from beginning to end. I also enjoy getting to see what our awesome designers have made with our craft collections. My desk is always covered in craft and everyone is really creative, which spurs me on to write creatively. I want to make sure that the copy works alongside nicely with the beautiful designs. Every day offers a different task, which is great. Working alongside people who you get on with socially and in a work environment is a great combination! I also did an Art and English degree, so working with a team filled with creative minds is perfect for me. It’s a hard choice because so many of the products that we sell are so pretty! I’d have to say Floral Muse because the collection is so varied and the designs are so rustic and vintage. I don’t do a great deal of papercraft myself, but it’s certainly making me want to! I love to shop, paint and read, but If I’m not being so proactive, I can’t say no to a TV show marathon (Greys Anatomy being the current choice). Visiting restaurants with my housemate is also really fun, eating out with our friends is genuinely our hobby! One of Sarah's colourful wall sized ink drawings. Being in this environment makes me want to craft. We preview new products and Maxine, our creative co-ordinator, works opposite me on a Monday. I write about her creative makes which encourages me to try new ways of papercrafting. Maxine always makes it look fun and the end product is always so beautiful! I recently made a card using Trimcraft products and a sock monkey my mum brought me for Christmas, which proudly sits at my desk. Sarah's first Trimcraft card and Mr. Monkey. My housemate would murder me if I didn’t take her abroad, so probably that first! I would treat my loved ones and make sure to split an amount across a variety of charities. I would buy a house that would have the space to hang my large pieces of art, with a dark room to produce photos..as well as a room dedicated to watching movies and eating lots of bad (amazing) food..all by the beach..with a swimming pool. I have a feeling I would run out of a million pounds quickly.. I went on a missionary trip to the Philippines to visit a charity organisation called Hands of Mercy who do incredible work, once when I was 16 and again when I was 18. This Charity is very close to my families heart and visiting this organisation will always be one of my happiest and fondest memories. In the future, I plan to visit again and to help with the programmes they run. Here is Sarah, her sister and a few members of the Hands of Mercy team in the Philippines.